So it’s the reciprocal play-date after school today for my five year old. Her first ever solo, after school play at a classmate’s. She was a little nervous a few days ago but seemed very excited this morning. So, it’s now just me that’s feeling a little fretful! I’m sure it’ll go well and the mum is lovely and has gone out of her way to make sure everything will be right. But still there’s the worry of the possibility of an allergic reaction, of me not having explained the piriton/epi-pen correctly … I guess there is just always something to worry about. Anyway, I made some gingerbread for her to take and share, in the shape of an apple this time as they’re doing an assembly about The Hungry Caterpillar this week and I thought it was fitting. – On a floured surface, roll out the dough to a 1/2 cm thickness. Cut into shapes with cookie cutters. 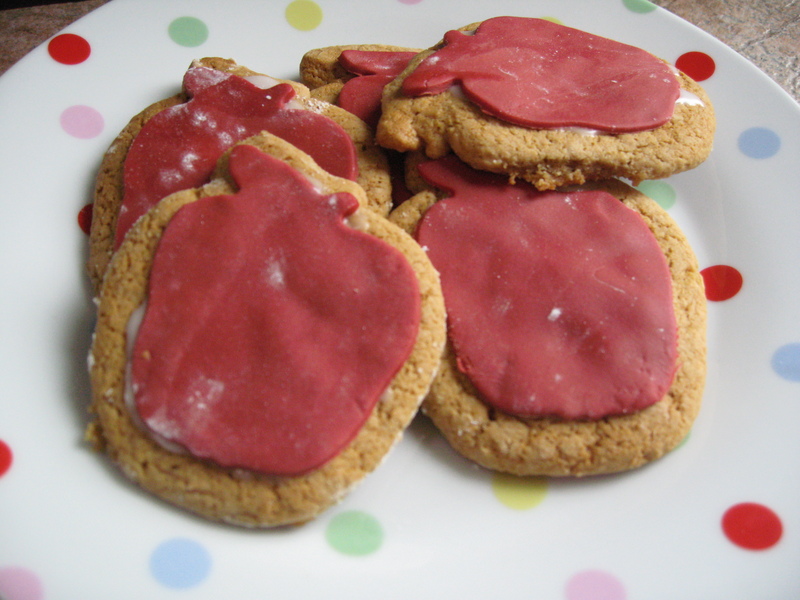 – Roll out the icing and cut out with the same cookie cutter. Spread a little icing sugar/water mix in each cookie to attach the icing. Previous Post Does an allergy become your identity?